Who decides on the use? 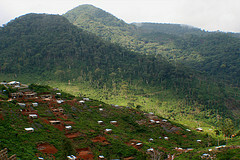 Landscape in Sierra Leone, 2009. Photo by Terry Sunderland for Center for International Forestry Research (CIFOR).In many tropical and sub-tropical regions, bushmeat use is regulated through various mechanisms that act at different levels of governance, from the local to the international level. At the individual, group or community levels, traditions may regulate the use of bushmeat through taboos and beliefs. At the community level, customary rights still regulate hunting and bushmeat use. However, formal regulations at the national level often recognize customary rights only to a certain degree. At the international level, bushmeat use is regulated by a number of conventions and regulatory frameworks. How do traditional rules and taboos govern the use of wildlife today? Taboos are moral or cautionary restrictions placed on certain actions by the authority of people (e.g., kings, priests, elders) and derive mainly from religious and long-established traditional beliefs and social customs. Some taboos have developed as a response to environmental problems. These conservation-related taboos may be categorized as species-specific taboos and habitat taboos. The species-specific taboos protect flora and fauna in space and time; they regulate and prohibit harvesting, detrimental use and consumption. Habitat taboos control access and use of resources in a particular area, e.g. in sacred habitats. Although taboos lack formal legal backing, they are still effective in regulating human behaviour and forcing compliance to societal values and, therefore, enhancing conservation. Indigenous belief systems and practices, such as dietary taboos play an important role in the exploitation of natural resources, including bushmeat. When applied to bushmeat hunting, species specific and habitat taboos can affect both hunting pressure in specific areas of the landscape and the targeting or avoidance of specific groups or species of wildlife. Traditional African cultural practices are generally built into ways of conserving and protecting natural resources against overexploitation through the use of taboos and totemic affiliation with localities and wild flora and fauna species. Village Wildlife Committee debates wildlife managament issues. Photo: Rolf D. Baldus. Globally, these practices have been effective in protecting ecologically and economically important species. In Africa, out of 70 taboo species, 20 are listed in the IUCN Red List of Threatened Species. The reason behind the conservation success of many taboos is the belief that non-compliance with regulations or taboos amounts to catastrophes such as disease outbreaks, death, severe drought, pests or loss of assets. Examples from different cultures in Tanzania abound. For instance, in East Usambara, an association of skin diseases with consumption of bushbuck (Tragelaphus scriptus) and bohr reedbuck (Redunca redunca) has reduced vulnerability of these species from extermination by humans. In Ugweno, a ground hornbill (Bucorvus leadbeateri) is protected by a belief that a person who kills it cannot stay alive. In Madagascar, several studies reported the relevance of taboos and cultural laws in the continued existence of forest biodiversity. In Ghana and Nigeria, studies have shown how clans protect their natural resources through the use of taboos and totems. East Africa also has a good record of effectiveness of taboo and social norms in wildlife conservation. The Boabeng-Fiema Monkey Sanctuary in central Ghana has been called a classic example of successful ‘‘traditional’’ conservation. Local hunting taboos on two species of primates: the Geoffroy’s black and white colobus (Colobus vellerosus) and the Lowe’s monkey (Cercopithecus campbelli), are thought to date back to the 1830s when a local oracle instructed the villagers to ‘‘care for the monkeys’’. In Amazonia, dietary taboos have been widely documented among various indigenous peoples and often appear as cultural responses to specific health maladies. Among indigenous peoples in the Neotropics, healers play a central role in reinforcing taboo systems through dietary advice given to community members. In many cases, taboos do not apply across the society but to specific individuals, or demographic subsets such as women and children. Bushmeat taboos are often believed to be essential to preserving good health, especially those taboos applying to children, menstruating women, and parents of new born infants (e.g., prohibition on the consumption of tortoises in eastern Brazilian Amazon), helped to maintain a steady supply of animal protein. Drawing on hunting return data, it appears that, while these dietary restrictions generally led to the local extirpation of tortoises, they also prevented over-exploitation of other harvest-sensitive game species such as primates and peccaries. Given the long history of Christianity and missionary activities in Amazonia, contemporary indigenous dietary taboos generally exist within the context of Christianity. State versus community or local management: who has the rights to hunt and who bears the responsibilities of wildlife management? Since the European colonisation period which promoted a very centralized way to managing resources, the breakdown in traditional controls over access to hunting grounds was observed in many tropical regions. As a result, a substantial portion of the world’s tropics is public property under the formal ownership of the State. But an important shift has begun to occur since the late 1970s in Latin America, and more recently in Africa and Asia, such that in developing countries at least 22% of all forests are owned (14%) or held in reserve (8%) for communities. The increase in community owned forests has been particularly remarkable in Latin America, where 149 million ha were transferred to communities between 1985 and 2002 in four countries alone (Bolivia, Brazil, Colombia and Peru). In Central America, some 2 million ha of Nicaraguan forest are located on lands that are titled to indigenous and ethnic communities, and almost 0.5 million ha have been granted in long-term forest concessions to communities in the Petén, Guatemala. Many of these changes are taking place as a result of the struggles of indigenous social movements for recognition of the territories they have possessed historically; others represent a variety of demands from non-indigenous actors (e.g., afro-descendants). Land reform has been a central development issue in Latin America for the past 50 years, and since the middle of the twentieth century the majority of countries in the region have designed and implemented some type of agrarian reform. Both environmental concerns and indigenous territorial rights have increasingly influenced the discourses, practices and modalities of agrarian reforms. In this context, wildlife is still the property of the State on private and public lands, but is autonomously managed in indigenous territories for subsistence use only. In Africa, the customary rights over wildlife and forests in general were profoundly changed due to the colonial legal system. 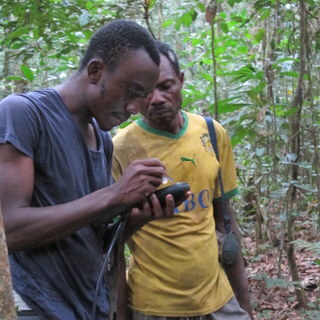 Training of hunters to monitor bushemat resources using camera traps in Ovan, Gabon. Photo: Nathalie van Vliet. At the beginning of the colonial era, land and resources became the property of the State under a highly centralized system of resource control. Colonial administrations tried to adapt written law to the existing, complex customary regimes and to modify traditional ownership rights. In African countries, laws governing access and use of forests, wildlife and other natural resources were passed in 1960s and these legal frameworks have changed relatively little since. Although communities cannot assert ownership rights, they have in principle permitted use rights on wildlife for subsistence (except in protected areas, unless specified by the management plan). Commercial exploitation of forest products (including wildlife) harvested under those traditional use rights is not permitted. Marginalising local people from benefits of wildlife has created strained relations with the wildlife sector, which are often worsened by human–wildlife conflict, heavy-handed anti-poaching and historical grievances over land. In some places, efforts have been made to remedy the trend towards ‘common pool resources’ via devolution of use rights over wildlife to communities and development of community-based natural resource management (CBNRM) programmes, particularly in East and Southern Africa (e.g., Botswana, Tanzania, Zambia and Zimbabwe). In Asia, there have been some remarkable changes in recent years in formal policies and programmes supporting greater engagement of rural people in the management of public land. Nepal and Philippines began exploring community forest management policies nearly 20 years ago. By the late 1980s, India began implementing joint forest management. Since the 1990s, Cambodia, China, Indonesia, Myanmar, Thailand and Vietnam have experimented with policies that involve communities in public forest management. They have already achieved significant success by involving people in natural resources management. However, the use of and benefits from the resources remain limited. In China, wildlife is the property of the State, with the clear legal consequence that compensation for damage caused by wildlife. Similarly, in Laos, wildlife living naturally in the territory of the State is "the property of the national community, of which the State is the central administrative representative", so an authorization is required for the possession of specific species of wildlife. In Bangladesh, their legislation does not include clear and specific statements on wildlife ownership but clarifies that any wild animal, trophy or meat shall be presumed the property of the government until the contrary is proven. In Malaysia, the Sabah Wildlife Conservation Enactment states that all protected animals and their products are the property of the government, unless they have been lawfully imported or obtained upon a valid license or permit. Similarly, in the Philippines, the constitution provides that wildlife is owned by the State, but the congress may, by law, allow small-scale use of natural resources by Filipino citizens and, to protect the rights of indigenous cultural communities to their ancestral lands, may provide for the applicability of customary laws governing property rights or relations in determining the ownership and extent of ancestral domain. In Vietnam, wildlife tenure is linked with forest tenure. The State manages and disposes of natural and planted forests and forest wild animals, allocating rights and obligations to forest owners, whereas ownership over planted production forests includes the forest owners’ right to possess, use and dispose of animals within the planted forest. How does the international institutional context influence the use of wildlife? Among the species-based conventions, the Convention on International Trade in Endangered Species of Wild Fauna and Flora (CITES) prohibits international commercial trade of species listed in Appendix I, requiring import and export permits with clear rules demonstrating no harm, and establishes strict requirements for any other international trade that is not primarily for commercial purposes. Species listed in Appendix II require export permits which are granted upon a finding that such export “will not be detrimental” to the survival of that species. CITES, therefore, requires countries to undertake non-detriment finding procedures to allow the commercial export of Annex II species. This often results, at the national level, in the development of management plans for species that are subject to international trade. Species listed in Appendix III may be exported upon confirmation of the legality of origin of the specimen or product to be exported. CITES also requires countries to have in place scientific and administrative authorities, which generally also regulate non-CITES-listed species. The Convention on the Conservation of Migratory Species of Wild Animals (CMS) aims to conserve terrestrial, marine and avian migratory species throughout their range, thus requiring cooperation among range States host to migratory species regularly crossing international boundaries. With regard to endangered species in Appendix I, States must prohibit their taking and conserve and restore their habitats, removing or minimizing impediments to their migration. With regard to species with an unfavourable conservation status listed in Appendix II, range States undertake actions to conclude global or regional agreements to improve the situation of these species. Agreements for international collaboration in migratory species conservation range from legally binding agreements to less formal instruments, such as memoranda of understanding (MoU). Several such agreements and MoUs have been concluded so far under CMS auspices, including: the Conservation and Management of Marine Turtles and their Habitats of the Indian Ocean and South East Asia, the Convention on Wetlands (Ramsar Convention), and the Convention concerning the Protection of the World Cultural and Natural Heritage (UNESCO World Heritage Convention), the Agreement on the Conservation of African- Eurasian Migratory Waterbirds (AEWA), the Agreement on the Conservation of Albatrosses and Petrels (ACAP), the Agreement on the conservation of Gorilla and their Habitats and several MoUs on, for example, saiga antelopes (Saiga tatarica), western african elephant (Loxodonta cyclotis), bukhara deer (Cervus elaphus bactrianus) and huemel deer (Hippocamelus bisulcus). Build incentives for conservation and sustainable use objectives. The Parties to the CBD have further adopted specific principles and operational guidelines on sustainable use (Decision VII/14: the Addis Ababa Principles and Guidelines for the Sustainable Use of Biodiversity), which provide guidance to ensure that the use of the components of biodiversity will not lead to its long-term decline. The Addis Ababa Principles and Guidelines have been drafted with a view to generating incentives for the conservation and restoration of biodiversity because of the social, cultural and economic benefits that people derive from it. These Guidelines apply to both consumptive and non-consumptive use of biodiversity. Although not legally binding, these Guidelines comprise several elements that may inspire national legislators in regulating the use of wildlife to ensure its sustainability, although their operation will require a flexible and adaptable legal and policy framework adjustable to local realities and specific ecosystems. Larson, A.M., Cronkleton, P., Barry, D. & Pacheco, P. 2008. Tenure rights and beyond: community access to forest resources in Latin America. Occasional Paper No. 50. Bogor, Indonesia, CIFOR (available at http://dlc.dlib.indiana.edu/dlc/bitstream/handle/10535/5255/OP-50.pdf?sequence=1&isAllowed=y). Assembe-Mvondo, S. 2013. 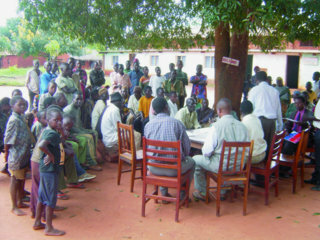 Local communities’ and indigenous peoples’ rights to forest in Central Africa: from hope to challenges. Africa Spectrum, 48(1): 25–47. Bahuguna, V.K. 2009. Community forest management in Asia – review of policy programmes. In CFIW, ed. Thinking globally – acting locally community forestry in the international arena. Proceedings of the Community International Workshop, 15–10 September 2009, Pokhara, pp, 9–11, 45–51. Barnes, J. & Jones, B. 2009. Game ranching in Namibia. In H. Suich, B. Child & A, Spenceley, eds. Evolution and innovation in wildlife conservation—parks and game ranches to transfrontier conservation areas, pp. 113–126. London, UK, Earthscan. Egbe, S. 2002. Forest tenure and access to forest resource in Cameroon. In C. Toulmin, P.D. Lavigne & S. Traoré, eds. The dynamics of resource tenure in West Africa, pp. 61–71. London, UK, International Institute for Environment and Development (IIED). German, L.A., Pierce, C.J.C., Barrow, E., Küchli, C., Blaser, J. & Wardojo, W. 2010. Forest governance and decentralization in Africa: linking local, regional and global dialogues. In L.A. German, A. Karsenty & A.M. Tiani, eds. Governing Africa’s forest in a globalized world, pp. 1–25. London, UK, Earthscan. Holmes, C. 2007. Linking livelihoods, land stewardship, and resource conservation in the Antongil Bay Landscape, Madagascar. In K.H. Redford & E. Fearn, eds. Protected areas and human livelihoods. WCS Working Paper No. 32 pp. 6–16. Inambdar, A., Brown, D. & Cobb, S. 1999. What’s special about wildlife management in forests? Concepts and models of rights-based management, with recent evidence from West-Central Africa. Odi (44). Jafari, R., Kideghesho. 2009. The potentials of traditional African cultural practices in mitigating overexploitation of wildlife species and habitat loss: experience of Tanzania, International Journal of Biodiversity Science & Management, 5:2, 83-94.